I don't really care for store bought ice cream, but I adore uncooked homemade ice cream. It can be a struggle to find non-custard recipes, but I've slowly amassed a collection over the years. This is a favourite during cherry season. 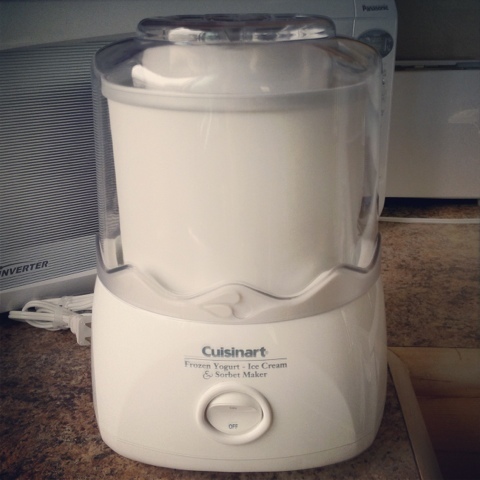 This is the ice cream maker that I use. It is the best of the reasonably priced home machines according to America's Test Kitchen, and is much cheaper now than when I originally bought it. It is very easy to use and clean. 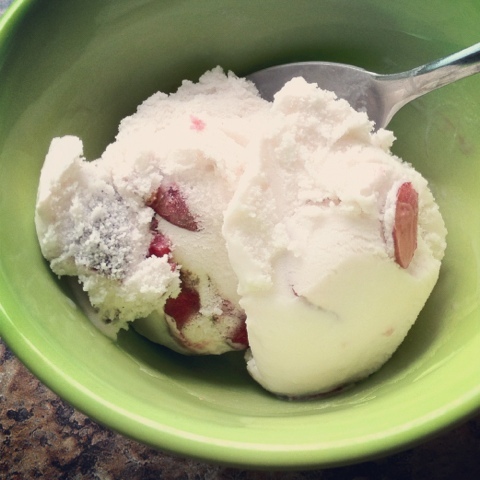 Combine all the ingredients except for the cherries and pour into the running ice cream maker. Let it run for 30 minutes or until the ice cream has gotten to the desired consistency. In the last 5 minutes add the prepared cherries. Once the ice cream is done you will have to put it into a container in the freezer for a couple of hours so that it will solidify. Keep in mind that it will melt quickly once you have removed it from the freezer as there are no preservatives or egg to keep it solid longer. Wish I were there to have a taste! Looks fantastic!